Tidewater Stage, Regent’s professional theatre company, launches its fifth season in June 2017 with the comic thriller Hitchcock spoof, The 39 Steps (June 16-18 and June 23-25). Purchase tickets at the University Box Office. 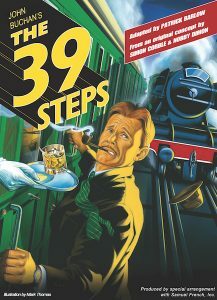 The 39 Steps ran in London’s West End for nine years, making it the fifth longest-running play in the history of London theatre. It ran for 771 performances on Broadway, has been revived twice Off-Broadway and has been produced in over 20 languages. Learn more about Regent University’s Tidewater Stage theatre and purchase tickets for upcoming performances.